Finding and downloading songs with a browser app is not a difficult task but you have to be careful while doing so. If the files are shipped in a compressed ZIP or RAR file, you may end up downloading ransomware, malware, trojan worm, etc. If you try to extract the infected file, the malicious code will execute and the Android OS will start behaving strangely. The best way to enjoy music without downloading MP3 or MP4 files is to tune into the local radio channels. Most mobile phones provide a radio app for listening to local radio stations. Frankly speaking, the local stations are horrible. They broadcast annoying chat sessions and stream the same songs every day. Furthermore, you’ll start hating the RJ’s voice if he cracks an unpleasant joke when you’re in a bad mood. If you want to discover new music or listen to international radio channels, download and use the following best Android radio apps. 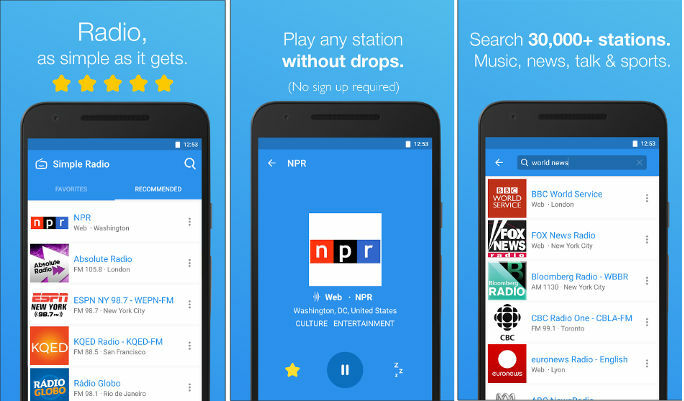 TuneIn is the world’s most popular radio app. According to the Google Play Store app download statistics, TuneIn has over 100 million users. TuneIn is a small app that gives you access to 100s of local and international radio stations. It detects your location automatically and suggests radio stations popular in your region. 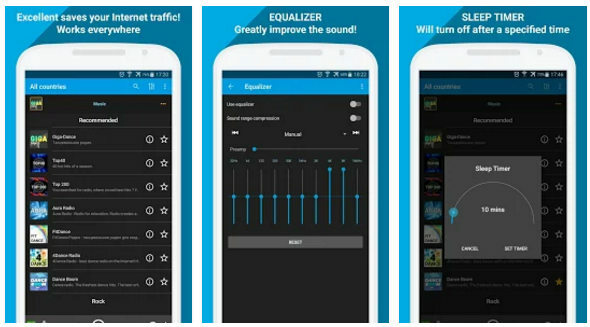 The app allows you to browse radio channels available in other states of your country. 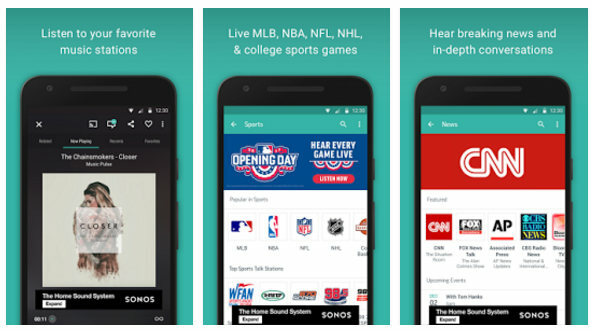 First-time users of TuneIn will see a large popup that has the option to enable 7 or 30 days free trial of the premium version of the TuneIn radio app. To close the popup and open the main interface, users should tap the close icon. When the TuneIn app opens its main window, you’ll see a list of news and music channels. To get started with TuneIn, connect your mobile device to the internet and select a channel which you want to listen. TuneIn allows users to browse and find radio stations by their name, category, etc. It provides a car mode interface. It includes a “favorite section” where you’ll find a list of the hottest radio stations on the planet. The app displays details on the currently playing song. It remembers the radio station which you have recently listened to. You can configure TuneIn to function as an alarm clock. The application ships with a settings interface and it has a nice UI. PC Radio is a tiny app that has a good userbase of 10 Mn. By default, the app displays all radio channels on the main interface. To see the list of stations available in your country, tap the globe icon and select a country. The app enables you to refresh the list of radio stations displayed on its main window. It offers an equalizer tool to adjust the bass, treble, etc. To stream a radio station, tap the play button. If you want to switch to another station, tap the next button. This app will provide a great experience when your phone is not in power saving mode. It features 100+ radio stations. With 50 million users, iHeartRadio is the 2nd most widely used radio streaming service on mobile devices powered by Android OS. IHR has a great interface and it gives you access to over 1000 radio stations that stream music, news, talk shows, etc. The app lets users listen to the songs vocalized by their favorite singers. It allows you to create a playlist of your favorite songs. Likewise, the radio app provides an option to browse playlists created by other users. The app enables you to listen to podcasts from renowned personalities. It has an option to skip the current track. Unfortunately, IHR is available for download only in select countries. 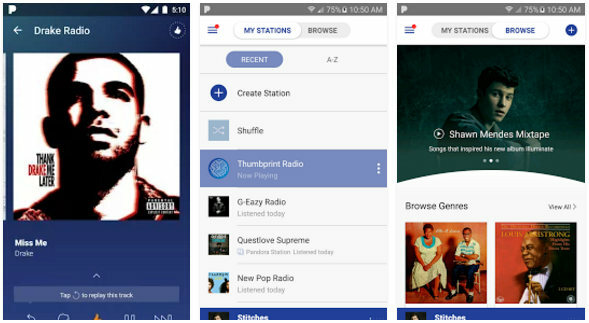 Like other applications, Pandora recommends radio stations to the user. One thing that differentiates Pandora from other apps is its like/dislike option which is powered by a special algorithm. This algorithm analyzes your dislikes/likes and generates a list of radio channels which you’ll find interesting. PR allows you to discover new music and listen to chartbuster tracks from various artists. It gives you access to playlists that contains hottest rock, pop, hip hop, etc songs of the decades. The app is available for download only in the United States. 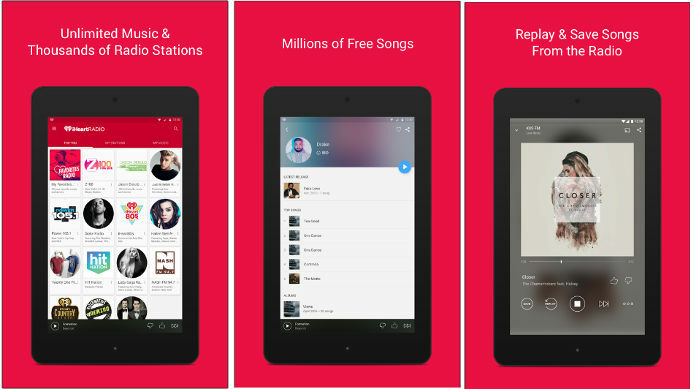 SR is another great Android radio app for streaming music online. It gives users access to over 30000 stations. According to its developers, SR has 5 million active listeners. The app is easy to use. Its interface is divided into two sections, favorites and recommended. The favorite’s section features a list of radio stations you have bookmarked. Tap the recommended tab to see the list of the radio stations the app wants you to listen. Conclusion: Music can ease our nerves. Hence, if you’re bored or stressed, download and run the above free radio apps on your Android device. The five applications we’ve shared above lets users listen to 100s of radio stations. They don’t force you to register an account. They require low system resources. Hence, the apps don’t affect the performance of the Android OS in any way.